It would be impossible to blog about life in the Netherlands and not write about the Bakfiets - the ubiquitous box-bike . It is, in my humble opinion, one of the coolest if not THE coolest thing about living in Holland. Wikipedia, as always, sums it up quite nicely in their definition of what a Bakfiets is: "Human Powered Vehicles designed and constructed specifically for transporting large loads". to various destinations on more than several occasions. But back to the topic. In my 8th month of pregnancy with my 2nd child, I decided that I absolutely had to get a Bakfiets, at that very moment. Without a car or any other practical form of transportation, I began to have nightmares of being housebound with a 1.5 year old and newborn during the eternal Dutch winter. De Fietsfabriek: Top of the line iconic Dutch brand and with a price tag to match. Starting price for the Bakfiets Classic is €1,895. Christiania Bikes: The Christiania bakfiets hails from Denmark. We love this one for its light aluminum frame. Starting price for a Christiania Cargo Basic is €1,549. Bakfiets.nl: The original Dutch "Bakfiets" brand. 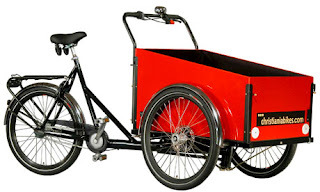 Starting price for the Bakfiets Cargo Trike is €1,785. Gazelle Cabby: Gazelle only makes a 2-wheeler bakfiets as far as I know, but quite a few friends rave about this bike. You usually can't go too wrong with a Gazelle, in general, they also make great bikes of very good quality. Starting price for the Gazelle Cabby is €1,699. *The Nihola is another brand that I've seen around quite a bit. I have a couple of friends that have really taken to this bike. Unfortunately I don't know a thing about it so can't speak for it one way or another. If the Bakfiets comes to your house in a big box ready to be assembled, as any of the above brands likely will: SEND IT BACK. There is a good chance that box came straight from China and that your Bakfiets, which is a cheap knock-off, will fall apart soon after assembly. I've heard horror stories about some of the cheaper Bakfiets copies losing their wheels while transporting children etc...You don't want this to happen to you. Just remember that the good ones come in one piece. A new Bakfiets from one of the top brands is a considerable investment. If you don't feel like you can drop €1,500+ to transport your large load, the next best option is to get one 2nd hand. There are not easy to come by because good used Bakfiets get snatched up like hot cakes. The overall mechanics and frame of a good Bakfiets generally hold up quite well. With regular maintenance and tune-ups, you can get a lot of years out of your boxbike. Beware that transporting a Bakfiets is not easy. If you find a good 2nd hand Bakfiets at a considerable distance (i.e. you cannot bike it back to your house), you will need to hire a little trailer or a truck to get it back to your place. As mentioned above, the good ones cannot be dismantled (trust me, we tried). Another place to try for 2nd hand bakfiets are directly through the retailers or big bicycle shops. They occasionally carry used models still in good condition. The Beer Transportfietsen in the Hague is THE place to get your Bakfiets in tip-top condition. These guys know everything there is to know about the Boxbike and you can often go and try a bunch of different models out. If you live in the Hague, it's a good place to start for feeling out the Bakfiets scene. They also have a whole slew of accessories for your Bakfiets and can customize your Bakfiets in the configuration you need (Installing an additional bench, Maxi Cosi adaptors etc...). If I missed anything or if you feel otherwise, please feel free to tack on your experiences and advice. In the meantime, good luck finding the best way to lug around your big load! Someone recommended this post to me and I think it is great information. I wondered if you would be willing to let me repost it on my expat parenting website (www.nomadparents.com). I would give you full credit with a link back to your blog and a listing on our contributors page. Sorry for putting this in a comment, but I didn't know how else to reach you.